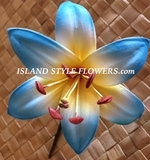 FOAM SPIDER LILY and LILY FLOWER HAIR PICKS: All On Sale! Designed after the beautiful Lily of the Valley Flower, this flower symbolizes longevity in the Chinese culture. An array of Vibrant & Exotic colors. The lotus flower represents long life, health, honor and good luck. Get yours today!